Poseidon solar water pumping systems are sun powered PV kits that enable users to pump water in remote locations with minimal or no grid access. Poseidon Solar Water Pump kits are reliable, stand-alone systems that require no fuel or batteries and require minimal maintenance. 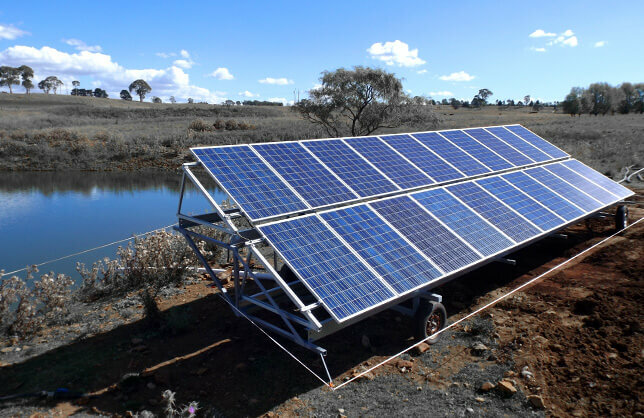 Each Poseidon solar water pump kit has a water pump inverter that can connect to the grid or work with a generator if longer water pumping hours are required (optional). From small or large scale agricultural or municipality water projects, Poseidon solar water pump systems are highly versatile and dynamic in their application. Designed for easy installation, Poseidon solar water pump kits are engineered to be particularly robust and are designed for long term daily use. 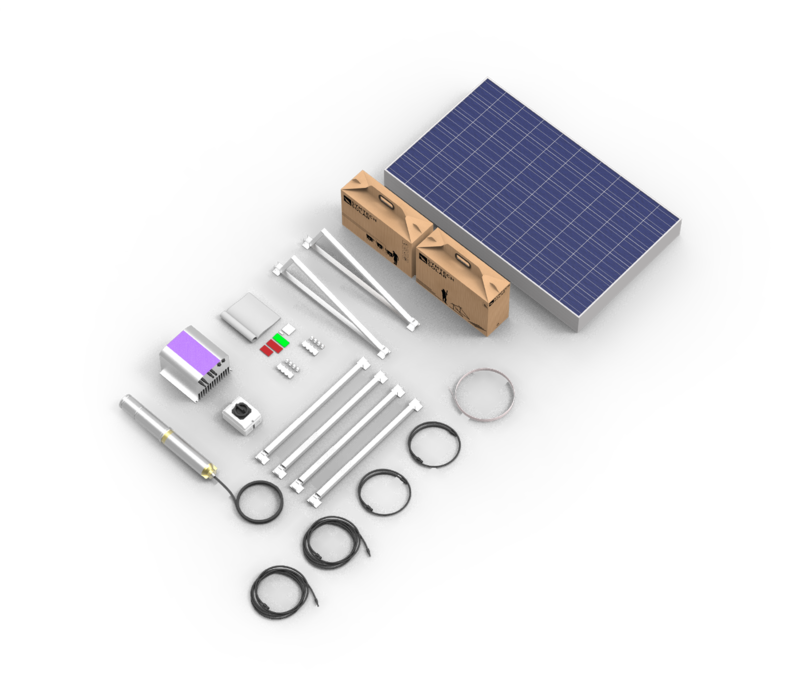 Each solar water pump kit can be outfitted with a deep well or surface pump thus ensuring the best solution possible. Water can be pumped to a holding tank or used directly on such things as agricultural crops, livestock, or human consumption. With multiple submersible pump sizes offered, users have flexibility in choosing water head, depths and required daily water flows. Whether a remote location or in an urban setting, solar water pumping is the practical way to deliver water in where you need it the most. Submersible Solar Pumps can lift up to 200 meters and fit in a 8″ or larger well casing and are used when the water supply is deeper than 6 meters from the surface. Submersible solar pumps kits can operate directly off solar panels, generator or an AC power source. Water is pumped during the day when the sun is shining and stored in a water cistern or water tank for a 24 hour water supply. Surface Solar Pumps are good for applications with shallow wells less then 6 meters, springs, ponds, streams or storage tanks. Surface pumps should be mounted in dry, weatherproof locations or housings as close to the water source as possible. Surface pumps can’t lift water very high from a deep source but they can then push water great distances and are optimal for many applications. Poseidon solar pump kits are designed to extract water for diversified range of agricultural applications including livestock and crop irrigation. These systems require no batteries and are often used in remote areas where the cost of running traditional AC powered water pumps is cost prohibitive. Our Water Pump PV Systems are available in multiple layouts and can be designed and engineered for your specific site characteristics. Choose from a variety of pre-engineered pumping systems or call us for a custom designed solution. Our solar water pumping systems are designed to make logistics, installation, and commissioning easier. The difference is clear, get better results with our all in a box packaging solutions. Symtech Solar’s heavy-duty ISPM15 Compliant crate design not only protects the solar water pump system contents during international shipping but also ensures that the solar water pump kits arrive to their destination site undamaged ready to be installed. We strive to manufacture and deliver the most simplified and easy to install solar water pump solutions on the market today; because we believe access to clean water is the key to a healthy life. Sunshine and water, it couldn’t get any more sustainable than this.